How do we assign a genre, when something is breaking boundaries and creating something which at the time was quite unique? On the other hand, so many elements are previously known, is this evolution or revolution? 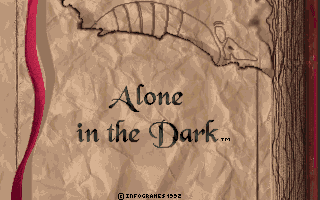 With Alone in the Dark, we see both a game which moves Adventure into 3D (mostly), as well as being the inspiration for an entirely new category of games, although the originator is often forgotten. Created by Infogrames in 1992 it borrows heavily from horror novels and films to create a creepy and atmospheric adventure, filled with puzzles, traps and monsters. The game uses both 2D backgrounds with 3D characters, and the CD-ROM version also has a magnificent orchestral soundtrack as well as voice-acting which sounded a lot better to me 25 years ago then it does today, but it was good for the time. On my door, a dull brass plate says “Private Detective”. The few friends I have call me Carnby, the others call me the Reptile. I don’t care to think what my banker calls me, these days I leave my letters unopened; bills and threats to send in the receivers just ruin my day. When an antique dealer called Gloria Allen contacted me, I slipped into my best shirt, holstered my .38 and got to her shop as fast as I could. I was expecting something sordid, blackmail probably. Boy, was I wrong! What I was asked to do was visit a property called Derceto and find a piano in the loft. It was an old piano, with secret drawers, the kind that people in antique stores go crazy over. The Derceto house is supposed to be piled high with classy junk, furniture, books, paintings. It looked like whoever owned Derceto was about to get cleaned out. I was going to bring up the subject of money when Gloria Allen handed me $150 and a key. I kept myself from grinning at the thought of my banker’s surprise. He doesn’t like his victims getting away. I looked over a copy of the police report. The former owner of Derceto, a guy called J. Hartwood, had hanged himself in the loft. The coroner concluded it was a clear-cut case of suicide. I promised Gloria Allen I’d give the place a look-over. My report will be ready in a couple of days. I’ve been reading up on the history of the old house, it’s the kind of place ghosts run away from in terror. Grisly murders, curses, lunacy… Luckily devil-worship makes me smile, so this is my idea of a paid vacation. One of the things I most appreciate about the introduction, is that your journey into Derceto uses the exact same rooms you’ll see as you progress through the house, giving you an idea of how to escape, if you could possibly make it that far. But for now, all we’ve done is walk into a seemingly empty house, seen the doors close behind us (just a draft, I’m sure, these old houses are all the same), and made our way to the attic. 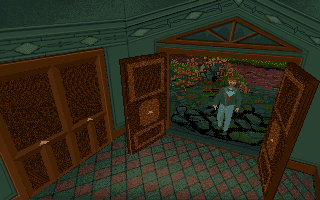 To maximise the atmosphere this otherwise very simple introduction to the game avoids any comment on the house as your character makes their way to the attic, and with no narration or text the player is left to see this vacant house, full of rooms and passageways. The footsteps are loud, the floorboards creak with every step, while the grand music provides a vivid contrast to the sparse rooms and empty corridors. The fixed camera, a style which became intensely disliked by many in later years, provides a claustrophobic perspective, and the choice to use unconventional angles does much to heighten the feeling. It can be used to frame aspects of a room, or be more tricky and hide them from the player, and the use of odd camera angles is often used in film for this same effect. Everything in the design is done to make this seem like an inhospitable place, the idea being that the house wants to trap and kill any that may venture within its walls. Death lurks around every corner, quite appropriate for something that borrows from the likes of H.P. 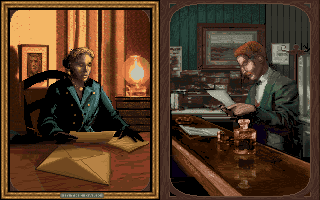 Lovecraft, but as a seasoned Sierra adventure game fan, I know to save often! Around us are various objects and items to catch our eye, including those in 3D. The music changes, and we are left, Alone in the… actually it’s quite light inside the attic thankfully. This first room gave me a lot of trouble when I first played it many years ago, so I can at least remember this upper floor. The rest of the house is a far more hazy memory, so we shall see how soon it tests my skill and patience. Although I have a lovely boxed copy of the Alone in the Dark trilogy, for this review I’ve got a digital version from GOG.com, which is the CD-ROM version. The game’s controls and fixed camera angles can provide additional frustration for modern gamers, but I’d welcome everyone who can to play along! Alex Romanov here, well well, one of the most classic titles, finally. This introduction competes with Fate of Atlantis for the best intro in a game ever. I recommend you to play the dos floppy disk version for the midi music, which I find much more haunting and terrifying. Also, this game has "alternate solutions" in the form of you can avoid almost all enemies in the game with some puzzling, not all, but most. I credit this game as the start of my love of the horror genre. We got a demo from one of our computer magazines during our elementary days. I remember inviting my cousins over to play with us. We didn't know what horror games are and as fate would have it, we played early evening (6pm-ish). 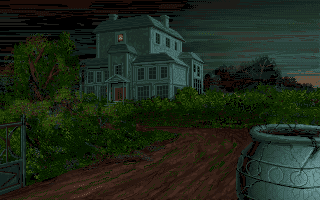 The game graphics blew our mind and scared our wits at the same time. The demo only covers the attic section, but we explored the entire location and solved all the puzzle. We also played the demo many times. When I finally got the full cd version years later, I was able to solve this section just from memory alone. Our demo don't have the CD music and instead got the (was it MIDI?) disk music. With our version, when there's a monster, we get a sudden loud piano note played which made us jumped (also our first introduction to jump scares in a video game). It was so memorable for me, that when I played the CD version, I was not happy with the smoother build-up of the monster music. I haven't actually finished this game. I hope to find the time to play with Andy (and not get busy like during the Star Trek playthrough). Funny to note that Emily Hatwood was there for the sake of having a female character and was completely dropped from the sequels in favor of the (face-changing) Edward Carnby. I love the beginning of this game and the attic section which give you several clues on how to tackle the puzzle while applying pressure and stress at the same time. This game TERRIFIED me as a 15 year old. Was the first of its kind. I'm a big fan of horror games, movies and books, but haven't played this one properly - so I have my GOG version installed and am ready to play along in between solving King's Quest puzzles. I'm guessing it won't score too highly, looking like more of an action game. I'm guessing 39! It's just occurred to me that "Infogrames" is not "In-fo-graymes" to rhyme with "names", but rather what in English would be "Infograms" or "Infogrammes". And by "just occurred to me", I mean since I heard of it at all in the 90s (possibly/probably Drakkhen). Yes? Wikipedia suggests that originally the company was supposed to be named "Infogramme", which was a portmanteau of "informatique" and "programme" . Wow! Alone in the dark. That beginning in the attic with the hellhound jumping through the window... that was a good scare even being already 17 or 18 at the time. And the great music. I remember though that it was really slow, specially in my 286. I also played first the demo from a magazine like MrValdez, and only much later the full game. I'll guess 62. I vaguely remember this from my youth so I know I played it (or saw it played) at least once. More recently I saw a Let's Play of it, though I still barely remember anything. I'm gonna say about 50, though that probably depends on whether the graphics are judged "for their time" or overall, and also, like others are saying, if it translates well to the PISSED rating. 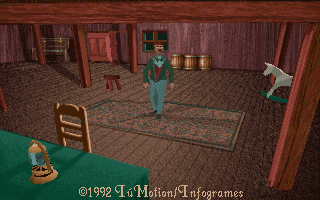 As a side note: really bad early 90's polygonal graphics always gives me the creeps. I never made the connection before, but it's probably due to the (very brief) time I played this game as a kid. Let's say 45, just on the assumption that this does not rate well on PISSED scale. Never played the game, but wathced Projareds playthrough and regarding the rest of the series the only one I have any relation to was the the one for... PS2 I guess where you could switch characters during the game (like in Resident Evil Zero, which I have played) since I had the trailer on some DVD from some magazine. And the dice says 37, and it seems I continue to skew the average result either way. I'll guess 56. No idea whether it will actually be a good game that doesn't score well on our scale, or an average game with a more average score. The primitive polygons with great static backgrounds always annoyed me, mind you the early polygon graphics never worked for me. It always felt like they were trying to showcase new technology before it really worked (though I have said this before). But such is progress, we have to start somewhere right? Fixed camera angles were also better when used right for me, the early days had a lot of issues with moving camera angles that could really mess you up by wildly swinging around at the least opportune moment. Not that they had much choice with the static backgrounds, but still. I do foresee some angle issues like missing potential exits to screens though, going to guess 68 as it does look like it has great atmosphere though! King's Quest VI - WON! Thrice!